The mid-winter festival of light, where the darkest part of the year begins, imperceptibly, to relinquish its hold, making way for the light. in situ:, Cambridge’s environmental theatre company, will ‘mark the time’ in Midwinter Light, with their trademark combination of movement that is at once enigmatic and visceral, using poetic association, almost-told stories, and objects and materials that teeter between the familiar and the very out-of-place. Taking place among the bare trees of the orchard at Wandlebury Country Park on December 15 and 16, the performance moves between light and darkness, between the human and not-quite something other, between the warmth and reassurance of community and the unknown worlds of pasts that may never have been, but which we strangely recognise. Midwinter Light is the first performance in the Calendar Project, an ambitious cycle of performances that follows the changing of the seasons. Bella adds: “The cycle of the year, with its light and dark halves, and the points where one turns towards the other, or where both are held in equilibrium – these are transformations around which we have built notions of time and change, continuity and eternity, journey and return. 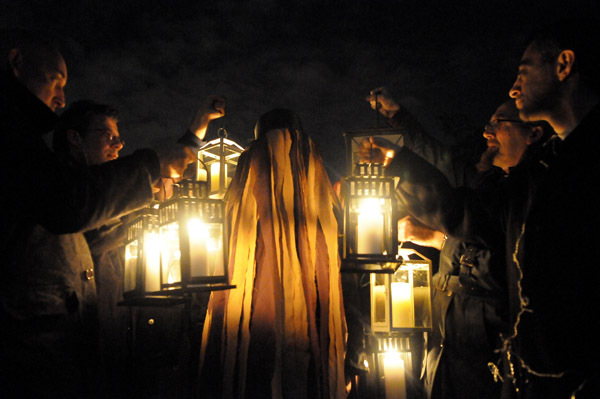 Midwinter Light runs for two nights only: Saturday 15 and Sunday 16 December at 7.30pm. Tickets are £10, £8 concessions, and performances will be about an hour. You will need to wrap up very warmly! Bring a rug or blanket if you wish. Places are limited, so please book ahead if you can, though some tickets will be available on the night, from 7pm.